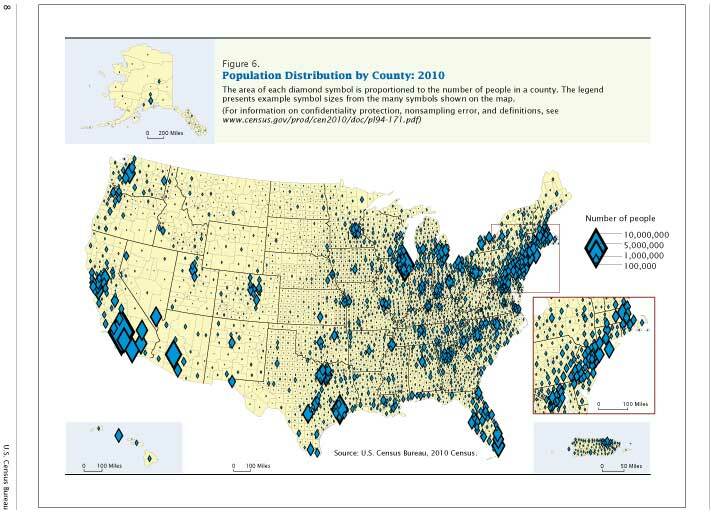 Today the U.S. Census Bureau released the first two of a series of 2010 Census briefs that offer a closer look at race and population in the United States: Population Distribution and Change: 2000 to 2010 and Overview of Race and Hispanic Origin: 2010. 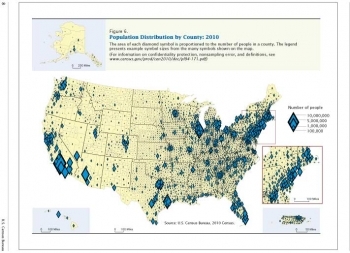 Population Distribution and Change: 2000 to 2010 analyzes the nation’s population change for the United States as a whole as well as its regions, states, metropolitan and micropolitan statistical areas, counties and places. It shows that over the past decade, the U.S. population increased by 9.7 percent – a rate slower than recent decades – but surpassing the 300 million mark to reach 308.7 million people. The South and West accounted for 84.4 percent of the U.S. population increase from 2000 to 2010, enough for the population of the West to surpass that of the Midwest during the decade. 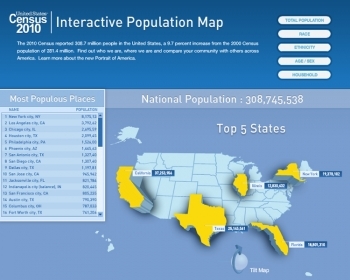 Between 2000 and 2010, all 10 of the most populous metro areas grew, and almost two-thirds of the nation’s counties and nine of the 10 most populous cities gained population. Looking at our nation’s changing racial and ethnic diversity, Overview of Race and Hispanic Origin: 2010 shows that the Hispanic and Asian populations in the United States have experienced the fastest growth over the past decade. While the non-Hispanic white population is still numerically and proportionally the largest major race and ethnic group in the United States, it is growing at the slowest rate. The rise in the Hispanic population accounted for more than half of the 27.3 million increase in the total U.S. population. But more than any other race group, the Asian population grew the fastest, increasing by 43 percent. The new mean center of population for the United States was also announced today; as of April 1, 2010, it is near Plato, Mo. The Census Bureau calculated this point as the place where an imaginary, flat, weightless and rigid map of the United States would balance perfectly if all 308,745,538 residents counted in the 2010 Census were of identical weight. 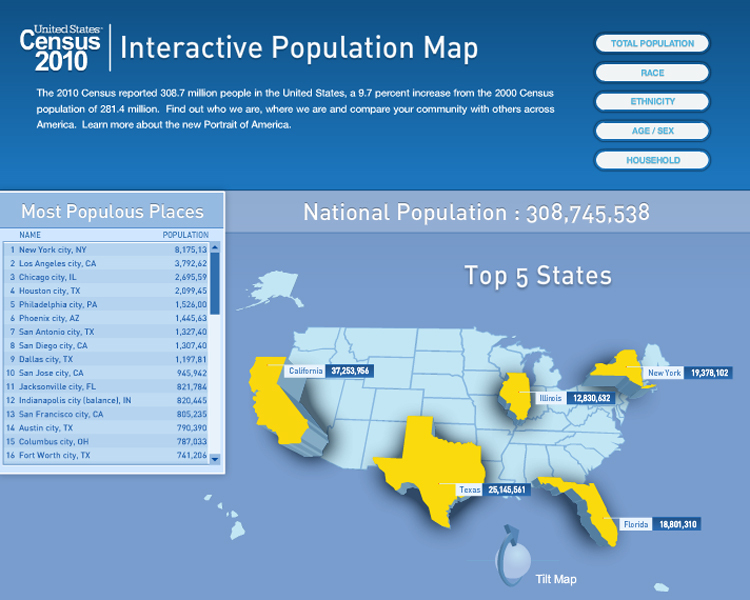 The center of population tells the story of America, following a trail across the country ─ across Maryland, Virginia, West Virginia, Ohio, Kentucky, Indiana and Missouri ─ that reflects our history of settling the frontier, manifest destiny, waves of immigration and regional migration.